Do you remember when you purchased the toothbrush you currently use? How long do you typically go before you decide to replace a brush? These questions can have more bearing on your oral health than you might realize. Under normal circumstances, you should plan to replace a toothbrush at around three to four months. You should replace it sooner if you have been sick, or if you feel that the bristles are no longer in good shape. What you do for your smile at home is important. Quality care, combined with regular trips to see your St. Louis, MO dentist for routine services, allow you to vigorously defend yourself against tooth decay and gum disease. Your efforts to protect your smile can be undermined by bad brushing habits. By breaking those habits, you can do a better job eliminating oral bacteria, and clearing away food debris, before these materials accumulate and create problems. 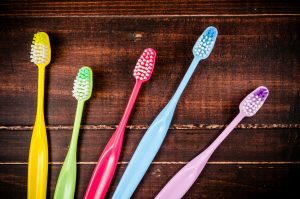 You should be brushing your teeth at least two times every day – and of course, these sessions need to be taken seriously to be truly effective. Are you consistently keeping up with the following? • Spending at least two minutes brushing your teeth. • Making an effort to reach every area of your teeth. • Cleaning your teeth at your gum line. • Using an ADA-approved toothpaste. A cavity does permanent damage to a tooth. At the least, Dr. Johnson will have to restore an affected tooth with a dental filling. For a more advanced cavity, more involved treatment can be required. In addition to brushing, you should take care of your teeth by flossing every day, and by maintaining a balanced, nutritious diet. Doing so can help you keep your enamel strong and healthy. You should be aware that your daily behaviors should not take the place of your routine dental exams. At every visit, you receive a professional cleaning – this session can remove any tartar deposits that might be present on your teeth, something you are not able to do by brushing and flossing. Dr. Johnson can also perform a detailed review of your oral health, which involves a check for any possible problems that might need to be addressed. At Magnolia Family Dental in St. Louis, MO, Dr. Johnson is prepared to offer quality oral health care to everyone in your family! If you are worried about the state of your smile, or if you want to make sure your teeth are healthy, please call Magnolia Family Dental in Kirkwood/St. Louis, MO, today at 314-822-4521.